In a nutshell: more success for your business. There are plenty of reasons to choose ProvenExpert. It pays to have a winning team on your side from the very start. 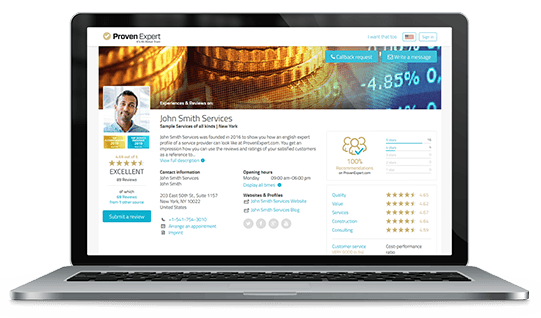 Learn more about how you and your customers can benefit from using ProvenExpert. You make all the decisions — designate who can give feedback and which evaluations are displayed in your profile. Get qualified customer feedback, conduct analysis, and display your reviews and ratings from other portals in a single location. With German data protection standards on your side, your information is always safe. All data runs over SSL-encrypted connections and is stored on severs located in Germany. Wait, there's more? With ProvenExpert, there certainly is. Want to give it a try? Anytime! Would you like to find out why more than 67,000 services are already using ProvenExpert successfully? Make a free appointment for an individual online demo and we will tell you all about it!